Agilent Technologies presents the newly enhanced N9020A MXA X-Series signal analysers. New enhancements to the midrange N9020A MXA X-Series signal analysers include options for 160-MHz analysis bandwidth and real-time spectrum analyser (RTSA) capability to address the challenges of measuring interference in the next generation of heterogeneous wireless networks. These options including the RTSA option, which is one-seventh the cost of a single-purpose real-time analyser, can be included in new MXAs or added to existing units. There is greater likelihood of unwanted signal interaction in the RF spectrum given the increased deployment of small cells and wireless LANs. 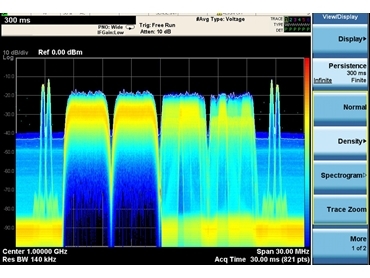 Developers see real-time spectrum analysis as a powerful tool for capturing and analysing highly elusive signals. Agilent's MXA with the RTSA option delivers 160-MHz real-time bandwidth and industry-leading overlap processing, a combination that enables accurate triggering on short-duration transients. In addition, the signal analyser's frequency-mask trigger and various real-time displays help users pinpoint intermittent interference problems. The functionality and performance of the MXA will help manufacturers seeking to maximise channel capacity, ensure that their devices are transmitting accurately and without unwanted interference. On measurements up to 26.5 GHz, the MXA now offers analysis bandwidths of 85, 125 and 160 MHz, all of which are available as upgrades to existing units. The 160-MHz option meets the requirements of 802.11ac wireless LAN and LTE-Advanced specifications, both of which use wider transmission bandwidths to satisfy ever-increasing demand for data. The MXA's ability to capture signals within a 160-MHz bandwidth with 72 dBc of spurious-free dynamic range enables users to rapidly characterise small signals near large ones. For deeper analysis, the real-time MXA also works with Agilent 89600 VSA software, allowing users to thoroughly demodulate and characterise highly complex signals.